Your ideal body weight is largely based on your height. 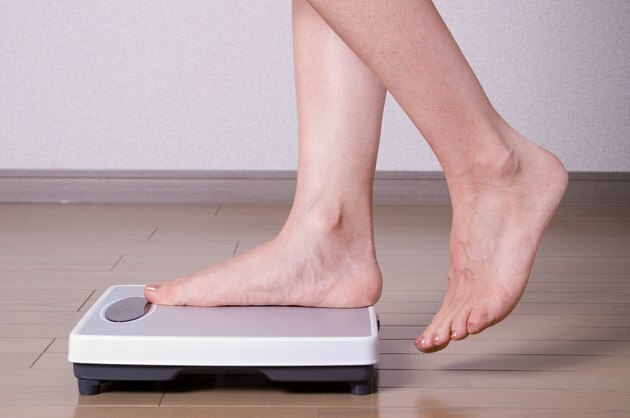 Even petite women can use their height to determine their ideal body weight. However, it's also established by your body frame, which falls into one of three categories: small, medium and large. From there, you should also determine your body mass index, a measurement of body composition, as well as your body fat percentage. Both of these numbers help clarify whether you're underweight, normal weight, overweight or obese. According to the National Institutes of Health, a woman should weigh roughly 100 lbs. for the first 5 feet of height and then an additional 5 lbs. for every inch over this height. If you're 5 feet 4 inches tall, your ideal body weight is right around 120 lbs. But with petite women of a small frame, you should also subtract 10 percent from this body weight. This means that your ideal body weight is now 108 lbs. Larger frames add 10 percent, so your ideal body weight is now 132 lbs. Body frame is determined by wrist circumference. Women under the height of 5 feet 2 inches tall are considered small-framed with a wrist that measures less than 5 1/2 inches and large-framed with a wrist more than 5 3/4 inches, notes the National Institutes of Health. Women between 5 feet 2 inches and 5 feet 5 inches have a small frame with a wrist of less than 6 inches and a large frame with a wrist over 6 1/4 inches. Regardless of your height, an ideal body mass index of a woman is anywhere between 18.5 and 24.9, advises MayoClinic.com. By using your height in inches and weight in pounds, you can easily establish this number. Multiply your weight by 703, divide this number by your height and then divide it again by your height. A woman who is 5 feet 4 inches tall and weighs 132 lbs. has a body mass index of 22.6. If this same woman was 108 lbs., she'd have a BMI of 18.5. Both of these numbers fall within the healthy range for body mass index. Another indicator used to determine ideal weight is body fat. The National Institutes of Health recommends women maintain a body fat percentage of 20 to 21. Unfortunately, the only way to determine body fat is to consult with a medical or fitness professional. A skin fold test is used to arrive at this number, which you can't do on your own. To maintain your ideal body weight, it's often recommended that you sustain a healthy lifestyle, which includes a well-balanced diet and regular exercise. Eating plenty of fruits, vegetables, whole grains and fish with moderate amounts of red meat, pork and dairy can help with your diet. At least 30 minutes of exercise, most days of the week is suggested to keep up your physical activity levels.